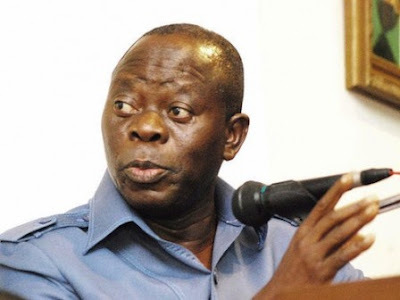 Governor Adams Oshiomhole of Edo state has revealed how former President Goodluck Jonathan threatened to cage him after May 29 for throwing his weight behind the candidature of President Muhammadu Buhari in the last general elections. He made the revelation in Benin during a meeting he had with leaders of the All Progressives Congress, APC, from across the three Senatorial Districts of the state. According to the him, “around this time last year, the tension in Nigeria was such that prophets of doom around the world were almost unanimous that Nigeria would not survive 2015 but as you can see, man proposes, God disposes. “Around this time last year, in January, a few weeks to the election, many were saying quite recklessly on radio and television that we were finished. “The former President, Goodluck Jonathan told our National Chairman, Chief John Odigie Oyegun, to inform me that after the election, he will put me, Adams, the son of Oshiomhole, in a hole and I told Chief Oyegun to inform him to dig that hole very deep because although I am short, in the course of pushing me into the hole, nobody knows who will get there first. Oshiomhole added: “In this hall, around this time last year, we held a meeting to share information about what was going on in various local government [areas] and the specific challenges in each of those local government [areas] in order to fashion out appropriate response. “Some of the statements that we shared in those meetings included threats that by June, Comrade Adams Oshiomhole would have been impeached because PDP would write results whether we liked it or not. They would overrun the House of Assembly and once the House is proclaimed in June, before the end of June, Comrade would be banished to his house in the village and from there to prison.